If its origins are confirmed, the asteroid or comet, named A/2017 U1, will be the first object known to come from elsewhere in the galaxy, say astronomers. A mysterious object detected hurtling past our sun could be the first space rock traced back to a different solar system, according to astronomers tracking the body. While other objects have previously been mooted as having interstellar origins, experts say the latest find, an object estimated to be less than 400m in diameter, is the best contender yet. “The exciting thing about this is that this may be essentially a visitor from another star system,” said Dr Edward Bloomer, astronomer at the Royal Observatory Greenwich. If its origins are confirmed as lying beyond our solar system, it will be the first space rock known to come from elsewhere in the galaxy. Published in the minor planet electronic circulars by the Minor Planet Center at the Harvard-Smithsonian Center for Astrophysics, the observations reveal that the object is in a strong hyperbolic orbit – in other words, it is going fast enough to escape the gravitational pull of the sun. Objects originating from, and on long-period orbits within, our solar system can end up on a hyperbolic trajectory, and be ejected into interstellar space – for example if they swing close by a giant planet, since the planet’s gravity can cause objects to accelerate. But Dr Gareth Williams, associate director of the Minor Planet Center, said that wasn’t the case for the newly discovered body. 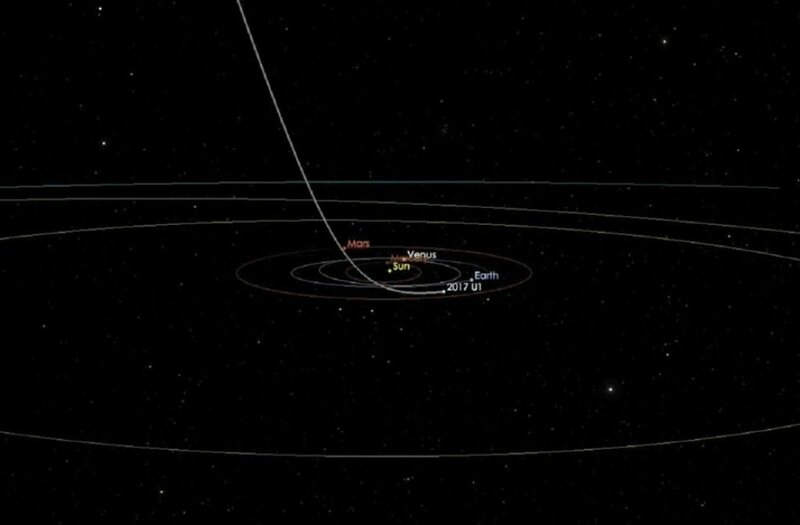 “If further observations confirm the unusual nature of this orbit, this object may be the first clear case of an interstellar comet,” the report notes. A second report, published later the same day, redesignated the object as an asteroid on account of new analysis of its appearance, giving it the handle A/2017 U1. According to observations made by astronomers, the object entered our solar system from above, passing just inside Mercury’s orbit and travelling below the sun, before turning and heading back up through the plane of the solar system towards the stars beyond. At its closest, on 9 September, the object was 23.4m miles from the sun. First spotted earlier this month by a telescope at an observatory in Hawaii, astronomers around the world are now following the path of the object. Among them is Professor Alan Fitzsimmons from Queen’s University Belfast. “It is fairly certain we are dealing with our first truly identified alien visitor,” he said. Fitzsimmons added that his team is currently working on measuring the objects’ position better to improve calculations of its trajectory, and to gather information relating to its chemical makeup, and size. Early results, he said, suggest that the object might be similar in make-up to many of those of the Kuiper belt – a region past Neptune in our solar system that contains myriad small bodies. Bloomer says we should not be too surprised if it does indeed turn out to have come from elsewhere in the galaxy. “Beyond the planets and past the Kuiper belt we think there is a region called the Oort cloud, which may be home to an astonishing number of icy bodies,” he said. If so, Bloomer said, there is no reason to suspect that disturbances to other star systems, as a result of gravitational interactions or other processes, wouldn’t throw material out too. “Just statistically, some of them are going to reach us,” he added. Williams noted that objects could also be thrown out from the inner region of other solar systems as a result of gravitational interactions with giant planets, casting them into interstellar space. And Fitzsimmons added that there was another possibility – that the object had been thrown out during the planet-forming period of another solar system. “We know now that many stars, probably the majority of stars in our galaxy, have planets going around them, and we know from studying those stars but also primarily from studying our own solar system, that planet building is a very messy process,” he said. With large quantities of material thrown out into interstellar space, said Fitzsimmons, is was expected that there would be objects travelling between the stars. “This object itself could have been between the stars for millions or billions of years before we spotted it as it plunged into our solar system,” he said. But, he noted, puzzles remain, not least that Kuiper belt bodies, which are believed to be icy, would give rise to an atmosphere and tail if brought close to the sun.